Since the Szechuan dish I cooked yesterday, Fish-fragrant Aubergines, gets its name from using traditional fish seasoning we figured we'd try that with two herring fillets we had in the fridge. 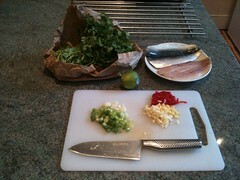 Garlic, chilli, ginger, spring onion and coriander for good measure. Fried the herring three minutes each side in a large pan, skin side first. After flipping the fillets infused some oil with garlic, chilli and ginger separately so as not to burn the garlic and make it go all bitter (photo). Plated up the herring with a big bunch of fresh coriander, some steamed broccoli, and then spooned the sizzling oil infusion on top (photo). Unfortunately I have a serious problem with fish bones... And herring is full of them. They are really thin, perfectly edible without any problem whatsoever, but they freak me out. Stupid. I love herring so much, and will definitely do it this way again. Excellent low carb dish, served with the broccoli.